Our work continues on Encinitas’ state-required housing plan, and the finish line is in sight! The final touches of the proposal we’ll be voting on this November are coming together. 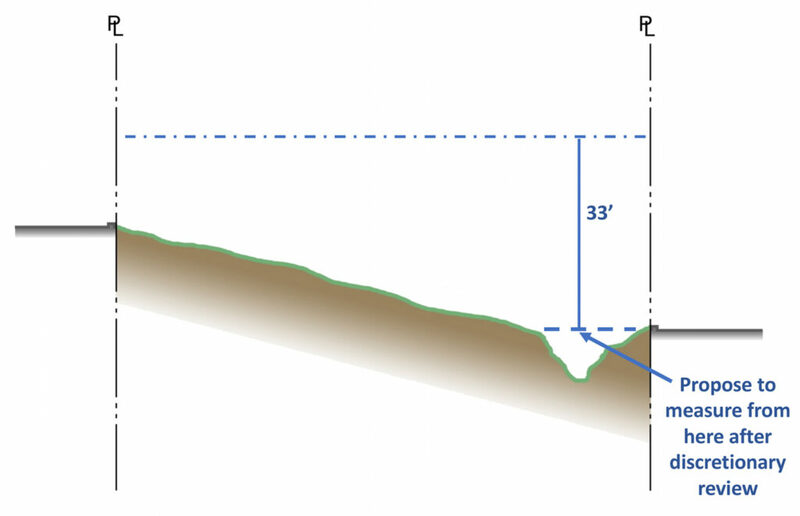 This week, the City Council went into considerable detail on what’s called “development standards.” Seen below, these graphics on where to start measuring the height of a building are good examples. Prop. A, the growth control measure that Encinitas voters passed in 2013, required measuring building height from the lowest point. The illogical result that can be created by this can be seen in the upper diagram. The good thing is that everyone seems to be in agreement about the need for change, including our advisory task force member who opposed the last housing plan and helped write Prop. A. The proposed solution, shown in the lower diagram, is to make determinations about where to start measuring building height by excluding anomalies like that ditch seen on the right side of both illustrations. The process will be discretionary, so decisions will be sent to the Planning Commission for review. This is one of many aspects that we combed over in great detail and will be part of the housing plan presented to voters – including height, massing, scale, unit size, setbacks and parking. As the housing plan comes together, it remains a process filled with strong opinions. When I think back on the last one-and-a-half years of guiding this effort, I feel we’ve succeeded in taking every possible step to make the process inclusive, fair, transparent, and comprehensive. The effort to get this long-simmering, complex, controversial and expensive problem solved has heavily involved your elected officials – far more than anything I’ve seen while in office. It boldly and specifically includes the viewpoints and participation of the group that opposed the previous plan. And it has been intensive, involving a trip to Sacramento to meet with regulators, and holding dozens of meetings. 3. Eliminating costly lawsuits based on lack of compliance with state law is fiscally responsible management of taxpayer money. Since 2013, Encinitas has only built 145 housing units in this low income category, but the city is supposed to have constructed 1,141 of those units. One of the reasons for this discrepancy is that we don’t have the land zoned to accommodate 25 to 30 housing units per acre. So the housing plan we’re putting together moves parcels into that higher zoning. 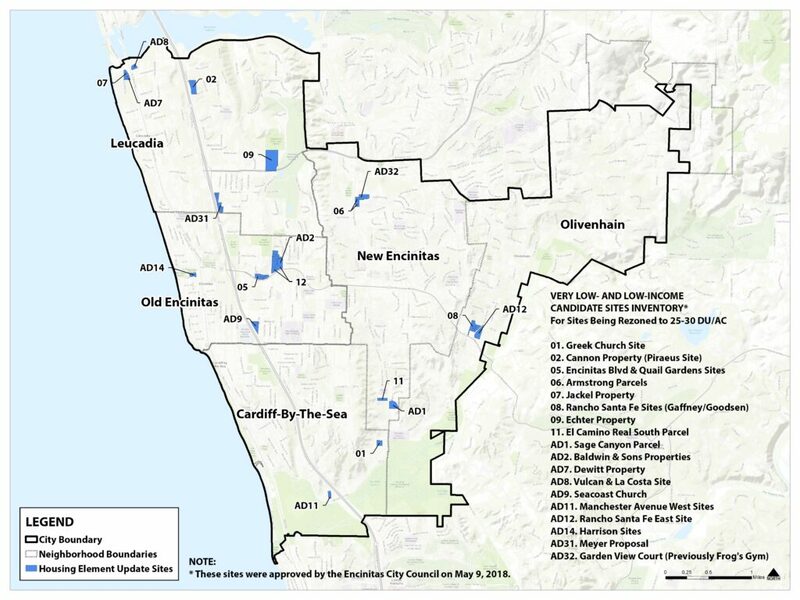 The total amount of housing that could be added under this plan if every site is built is slightly more than 1600 units, which is 6.4% more housing in Encinitas. Our housing plan is under intense scrutiny by state housing regulators. Every week, the attorneys who are suing us are writing to the regulators, we have residents both for and against more housing submitting comments, and we have our staff, consultant and attorneys going back and forth. Putting it mildly, it’s an unusual tempest of fierce examination and diverse, passionate opinions. The Planning Commission will consider the entire proposal on June 7; the City Council votes on June 13, and you’ll have the final say with your vote in November. The Voice of San Diego has two good articles on housing this week. 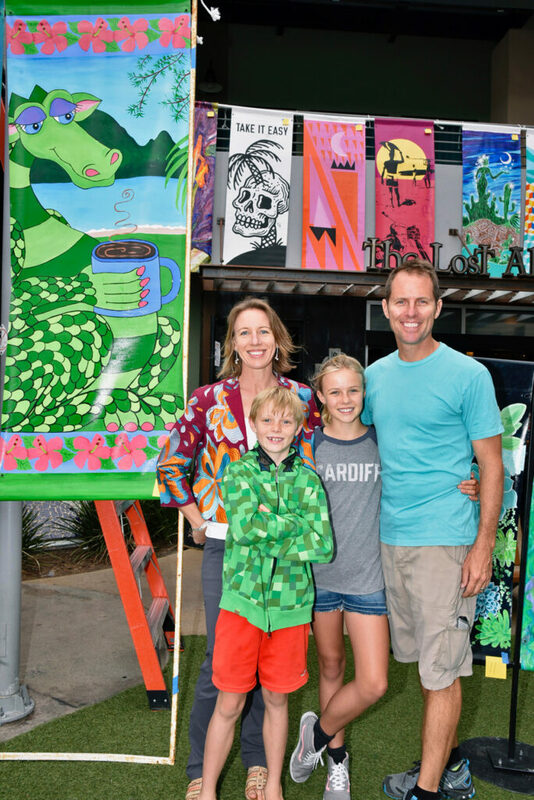 Here’s an article about the emergence of a pro-housing group in Encinitas called Keys4Homes. And the article Big Cities Remembered They Run SANDAG Now accurately captures the drama at SANDAG this week over whether to have a reconsideration of our earlier decision to negotiate with the state for a lower number of housing units in the housing cycle that begins 2021. One insight from where I sit – the NIMBY groups (Not in My Backyard) always remember to come to public meetings and express their concerns, but the relatively new YIMBY groups (Yes In My Backyard) are still perfecting how to effectively engage the public process. Those speaking in favor of more housing showed up this week at SANDAG, but when we made the original decision, none of them were present. 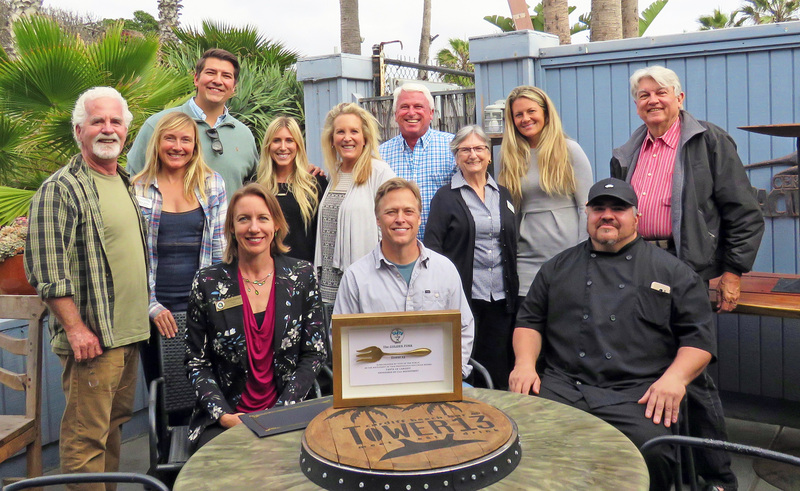 I was honored to help congratulate Cardiff Beach Bar at Tower 13 for their fourth win of “the Golden Fork” award from Cardiff 101 Main Street’s 9th Annual Taste of Cardiff. They won for their delicious “ceviche sliders,” which narrowly beat out Seaside Market’s octopus dish to win the coveted prize. For the third year, I joyously captured the “Best Salad” trophy at the Heritage Museum’s Lima Bean festival for my kale, lima bean, feta, avocado, dried cranberry salad. Yes! Finally, on Memorial Day tomorrow, our family will be at the American Legion Post 416, at 210 W. F Street in Encinitas from 10:30 am. to noon for their annual Memorial Day ceremony. Sometimes we can forget how complex and dangerous our world can be. By being blessed to live in a country that is not continually exposed to the threat of invasion from another country, we can lose sight of the fact that a fraction of one percent of our fellow Americans shoulder the heavy responsibility of defending our way of life across the globe. While the majority of the brave men and women who serve in the armed forces are fortunate to come home unharmed and intact, some do not. It is not only their lost lives, but the lives of their families, friends and loved ones who continually, day after day, pay that very heavy price of sacrifice. On Memorial Day, it’s important to remember that it doesn’t matter how we feel about any past or present military conflict, it’s important to respect and honor our fellow citizens in uniform for their willingness to sacrifice their individual freedoms, time with their own family and personal safety to protect and defend the America we all love. In addition to the day’s solemn meaning, I hope you have a relaxing holiday! Previous Post5/20/18: And we’re buying a Stairway to Beacon’s…Next Post6/3/18: Our Moonlight Beach Safety Center Officially Opens!